Let’s be real- the Pacers are not going to beat the Heat. The Heat are not only richer in talent, but are much deeper and more experienced as well. The only advantage Indiana has is its size in the paint, although we will see if the athleticism and speed of the Heat is enough to negate even that strength. However, if a few things fall into place, the Pacers just might be able to sneak out a victory. Namely, if these 3 things occur, the Pacers may find themselves in the Finals. The Heat need LeBron James, Shane Battier, Chris Anderson, Chris Bosh and Udonis Haslem to be able to handle David West and Roy Hibbert one-on-one. If any of those players require help in the post, that will open up penetration lanes for the Pacers and allow shooters like Paul George, D.J. Augustin and George Hill to get easy points from the perimeter. However, if “small-ball” lineups can handle the size of the Pacers bigs on their own, the speed and aggression of the Heat can shut down any driving lane that opens and make the Pacers have to work to score. 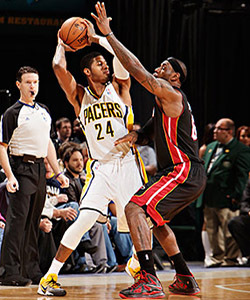 The Pacers have such a difficult time scoring that they can use any and all easy points they can get their hands on. 2. Paul George is an effective and efficient scorer. If the Pacers are going to be a contender to win it all not only this year but in years to come, they need Paul George to be a superstar. They need a player they can count on to get points every night while shooting a reasonable percentage from the field. Without 20 efficient points from George, the Pacer struggle to get to 80 points, let alone the 100 you will need to beat Miami. The problem is, George is not a guarantee to net an efficient 20. In the games the Pacers have scored 93 points or less in the postseason, George is averaging only 16.57 points and has generally shot a poor percentages from the field. In the games the Pacers have scored 93 points or more in the postseason, George is averaging 22.6 points and shot above 50% in 3 of 5 games. So basically, if the Pacers want to get the 100 points per game they need to beat the Heat, George has to play like the superstar many think he is. Roy Hibbert must use his size to tire Bosh and get him in foul trouble. Roy Hibbert stands at 7″2′, 280 pounds. That is 3 inches and 45 pounds bigger than his primary defender, Chris Bosh. 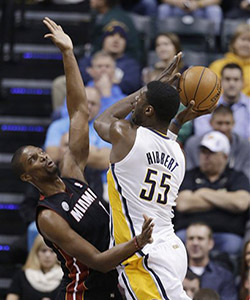 While Bosh has a speed and athleticism advantage, Hibbert must take Bosh to the block and punish him. Beat him up, make him work, and get him in foul trouble. A large part of Miami’s prolific offensive attack is that Bosh can draw the center away from the rim with his elite midrange shooting. Bosh’s shooting pulls Hibbert away from protecting the rim, so Hibbert is not there to help on LeBron post ups or Wade drives. If he does help, the ball gets kicked to Bosh or swung to an open shooter. If Hibbert can get Bosh in foul trouble, that means minutes at center for guys who do not have the range to stretch a defense (Chris Anderson, Joel Anthony), and Hibbert can shut down the paint. Much has been made of Dwayne Wade possibly being limited by his knee injury, but he is not the second most important Heatle in this series. That would be Bosh. Regardless of whether Wade is 50% or 500%, he is going to win his matchup with Lance Stephenson. The strength of the Pacers lie in their bigs, and without the rangy and underrated Bosh, the Heat are going to have a hard time slowing down David West and Mt. Hibbert. Pretty good analysis! Well done!